According to the Mental Health Foundation UK, cycling boosts your mood. 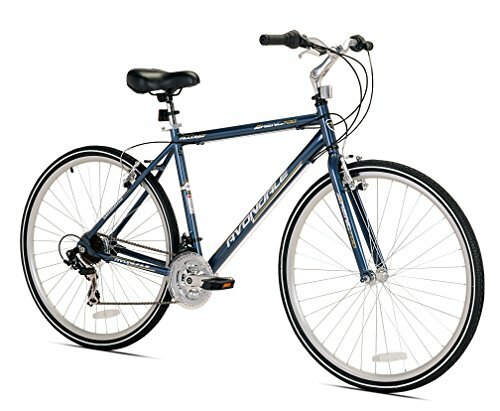 Finding the best hybrid bike made that true also. Buying one of the best hybrid bicycles doesn’t need to be a chore with a well presented comparison. A hybrid bike that can hit the road and conquer the mountain makes us all feel special. One myth about this kind of bike is that they’re supposed to “cost a bomb”, but it’s not true. These bikes can be budget friendly, and we’re going to prove it. To prove it we’re going to compare some of the best hybrid bikes under 500 dollars that will knock your socks off. Before searching for a brief overview of the hybrid bikes, check out their advantages. It will help in convincing you why you need a hybrid bike in the first place. Consider the advantages and benefits associated with the hybrid bikes and make the best choice. There should be one that suits your needs and preferences. So, Hybrid Bikes doesn’t have any drawbacks? That’s the question pinching you inside, I know. A Hybrid bike is not as fast as a road bike and isn’t as durable as mountain bikes. Still, people are fascinated with hybrid bikes. Why? Because of its versatility. One can use every day on the road or the mountain during the vacation! Why not, you tell me? TL;DR – The best hybrid bike for under $500 is the Schwinn Discover Men’s Hybrid Bike. If you want to read the rest of the reviews, please proceed down the list. We’ve compiled a huge amount of detail on every bike, including the pros and cons of each. Schwinn Men’s Siro 700cc is a real hybrid bike; it has a combination of affordable mtb under $500 status and the function of a road bike. When taking a close look at it, you will find that it has qualities of a mountain bike, it has the extra speed for climbing. The rider’s position is somehow upright than a regular fitness biking. Siro has some features which are very comfortable like adjustable stem in the form, front fork shock absorber and spring seat post which will absorb the shock if you are riding on a rough road or bumps. It has an adjustable handlebar which helps you to choose your best riding position. Siro has an alloy linear pull brakes and high profile rims which make it the beginner mountainbike to use on the city streets. The Schwinn Siro is a perfect bike for your daily riding, get your Schwinn Siro and enjoy riding. The Takara Sugiyama is an amazing piece of art. This fixed gear hybrid bike is sleek, smooth and a bike to adore. 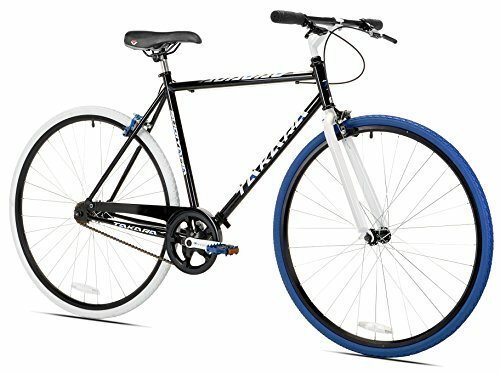 Takara Sugiyama Flat Bar Fixie Bike, Black/Blue, Large/58cm Frame comes with the black and blue color. Its handlebars are flat and well designed to ensure maximum comfort for the rider. The wheels of Takara Sugiyama are 700c (comes in large and medium) and 32-inch tires. Amazingly, the bike pedals of this bike are toned with the same color as the rest of the bike and fitted with their reflectors. Its steel frame has a standover height of 78.74 centimeters. The hand brakes of this bike are excellent. It is a perfect bike for use in different terrains. This hybrid bike is of Japanese origin. It is robust and solid. It has been designed for your urban riding pleasure. Just as its name suggests, this hybrid bike is ideal for commuters. Made with a double butted aluminum frame, it provides the ideal and comfortable way of commuting to work or school without giving you backaches or muscle strains. Complete with Shimano components, the Vilano performance 700C bike provides a fast and reliable way to employ gear changes. The Shimano trigger shifters are well affixed to the frame with the 21 speeds keeping you standby to shift the gears at any moment. 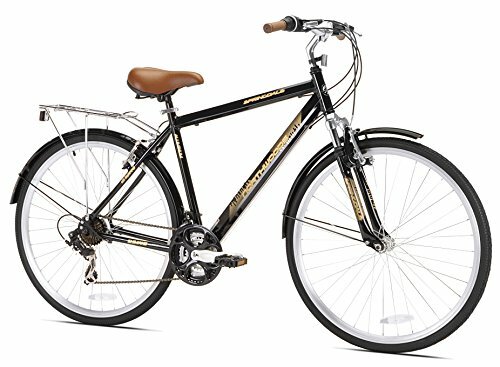 Schwinn Men’s Community 700c bike is ideal for a leisure ride, moving from one place to the other and exploring. 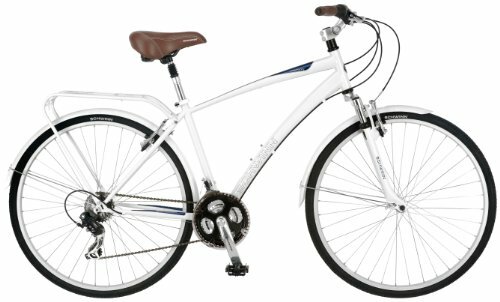 Featuring a Schwinn aluminum Hybrid frame as well a suspension fork, it offers a safe and comfortable ride. For swift gear shifting, the bike is fitted with a Shimano 21 speed rear derailleur. It has alloy wheels which are lightweight, high profile and strong. This bike is available in a black or white color to suit your taste. The performance hybrid bike is an epitome of a speedy, comfortable and yet budget-friendly bike. The bike has been well designed to suit both commuting as well as the mountain biking. Its frame is made of aluminum, making it sturdy and efficient, thus offering an enhanced visibility and relaxed upright ride devoid of body strains. The Shimano drive-train has 21 gears to enable you to get up over the hills as well as allow you to cruise on the bike paths comfortably. The dual pivot alloy caliper brakes make it easy to have controlled deceleration. It’s steady and speedy wheels have been fitted with 700c. 25c tires which allow comfortable handling and low resistance. The seat of the performance hybrid bike has an urban saddle for the physical comfort ride. The bike is an awesome choice for both commuters and the fitness riders. The Giordano RS700- Hybrid Bike prides in real road bike geometry which gives one a very aggressive riding position. It’s designed well to add to the convenience and comfort of the flat handlebar in place of the traditional road handlebar. The bike has numerous features and punches that have been beautifully made of an aluminum handcrafted frame. Precision 21-speed Derailleurs and Shimano Shifters which offers reliable and great performance. Though a very budget conscience bike, it has been well equipped with aluminum (700c) rims which greatly reduce the rotational weight. Giordano RS700 Hybrid Bike also makes the difference on how the bike climbs and accelerates. The bike is very good for fitness and can also be used for your daily commute. The bike is available in two men’s sizes; the medium size has fit riders of 5 feet and 7 inches-6 feet with an inseam of 29 to 31 inches. The large size has fits rider of 5 feet and 9 inches-6 feet and 2 inches and inseam of 30-33 inches. The bike is the embodiment of the fusion of tradition and the latest advancement of bicycle design and technology. 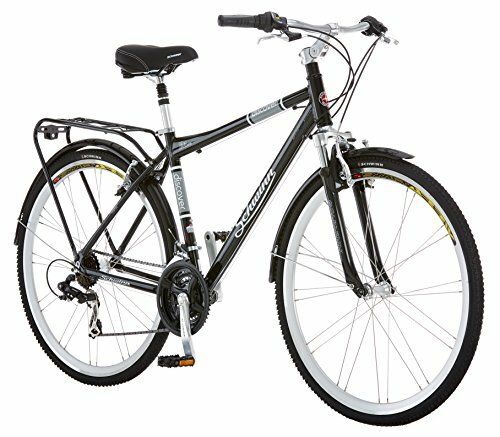 For the bike enthusiasts, the Kent Avondale hybrid bike is perfect for commuting around campus or town. 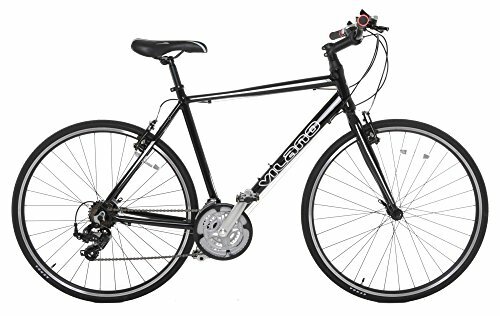 KENT Men's Avondale Hybrid Bicycle with Sure Stop Brakes, 19"
The bike has a highly advanced stop braking system. The braking system provides one lever braking which eliminates virtually the over the handlebar accidents which occur due to sudden braking. The bike has been equipped with the light-weight aluminum frame, Derailleurs, Shimano 21 speed Shifters and aluminum rims which have bolted on the hubs to deter theft. 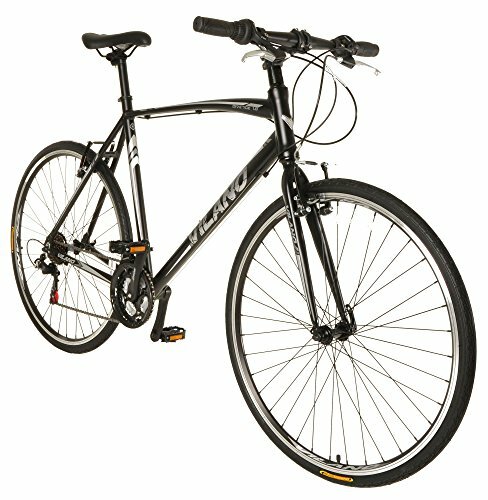 Schwinn discovers men’s hybrid bike comes with linear pull brakes which stop it easily. It has a chain guard and aluminum frame. The 700c hybrid bike has a suspension fork to absorb shock. 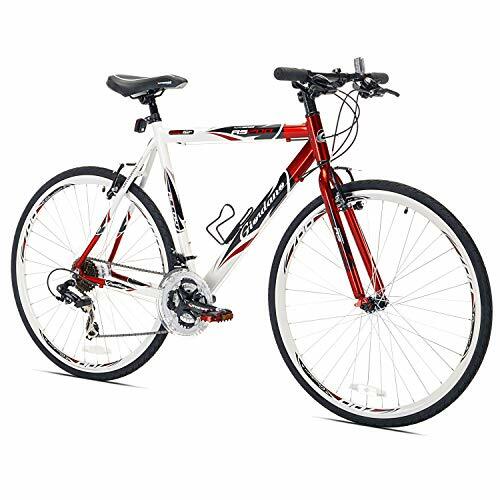 Also, the Schwinn discover men’s hybrid bike has padded saddle with suspension seat post. The bike has more additional features like adjustable stem fenders, 21 speed SRAM bike grip shifters which make it easy to change gears and alloy linear pull brakes. 700c wheel answers all your questions when it comes to pleasure when riding, get one for yourself and experience the pleasure of riding for joy. Those peoples who are searching for a dependable bicycle for recreational use or commuting, the Northwoods Springdale Men’s Crosstown is your best bet. 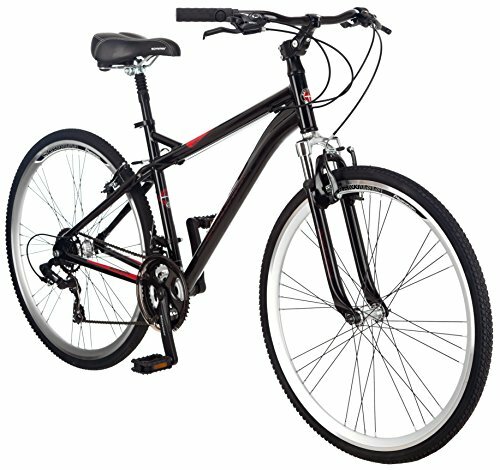 The bike features a well hand-crafted, light-weight aluminum frame and the 700c tires designed for a comfortable ride. It is also equipped with the Shimano component such as the Shimano Tourney rear derailleur. Its Northwoods Springdale offers 21 speeds enhancing easy adjustability up and down the hills. The linear pull brakes, on the other hand, offers confident stopping power. The bike is available in white (Women’s) and black (Men’s) colors. Each of the above bikes are top choices for buying a budget hybrid bike that isn’t going to cost the world. As pointed out earlier in the article, the best option for performance, price and quality is the Schwinn. It is your choice though, and before you make a decision I want to give you some essential buying tips as well. Keep reading if you want to know a little more before you make your choice. Hybrid bikes are very comfortable to ride. It can be attributed to the long and flat handlebars which allow the cyclist to sit in a relaxed cycling position. Hybrid bikes have a frame which made from different materials like aluminum, steel, and high-tensile steel. The tires are designed to have a smooth parallel thread on the inner side and a rough thread on the outer side. Which gives it the ability to easily roll over no matter the nature of the terrain that you are on. Hybrid bike has great suspension fork which makes it comfortable. The most fork has coil springs or elastomers. Gearing, this makes it easy to cover challenging terrains easily and make changing gear much easier. Hybrid bikes are lighter compared to mountain bikes which mean you will use less energy to travel the same distance. Since a hybrid bike contains several features, buying the best one for you can be a daunting task. It is not as simple as buying a road bike or a mountain bike, instead, you will have to put a lot of factors into consideration. After deciding on which hybrid bicycle you want to buy, the next important thing to consider is the bicycle tire. The importance of the tire in a bike is compared to life; tire makes a great difference to your bike. Most hybrids no matter the rim size comes with a 700c wheelbase and tire. 700c is designed to move on the pavement and to make the movement easy even when driving through uphill. Be sure to get the right size. You will not be motivated to use a bike which is not comfortable just like wearing too big or too small shoes. To choose the right size of a bicycle just stand in the middle of the frame and make sure that your feet are in a comfortable position. Seats for most hybrid bikes are padded. Not like the ones for a racing bike which is covered with foam. Some bikes have added suspension; this may be comfortable for some riders and uncomfortable with others. It’s worth thinking about. Gearing really depends on the type of road the rider is using. If you are in a mountainous place, then you are going to need more gears. Modern bikes can easily change gear just by pressing the gear button. For a commuter, the high number of gears isn’t a huge issue. It is important to know if the gears are of high quality and match the purpose. Gears should be used correctly depending on the nature of the terrain. A standard gear count hybrid bike is going to be fantastic for most of us. However, if you want the extra flexibility to do as much as possible with your hybrid bike then a larger amount of gears is going to be better. If you have a tight budget, yet want to ride on the mountain and the road, undoubtedly a hybrid bike is the right solution. Hybrid Bikes are definitely cheap compared to other bike types. Yet those are often considered the better purchase. Hybrid bikes are the way to go in case you need to cycle safely, but fast in a variety of terrains with the maximum comfort, they are the perfect all round bike. The best hybrid bikes are adaptable, versatile and hard wearing. A perfect purchase for under 500 dollars.